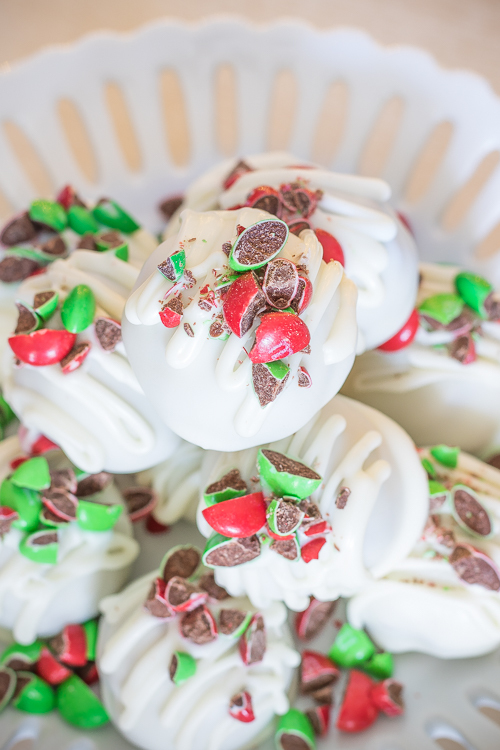 Oreo Cheesecake Balls, all dressed up for the holidays! Oreo truffles are a classic party dessert. They are SUPER delicious plus amazingly easy to make, so what’s not to love? I have made them different ways and with all the variety of Oreos you can find these days, the flavor combos are literally never ending! I’ve made them classic before and a peanut butter buckeye version, but I’ve never tried red velvet! 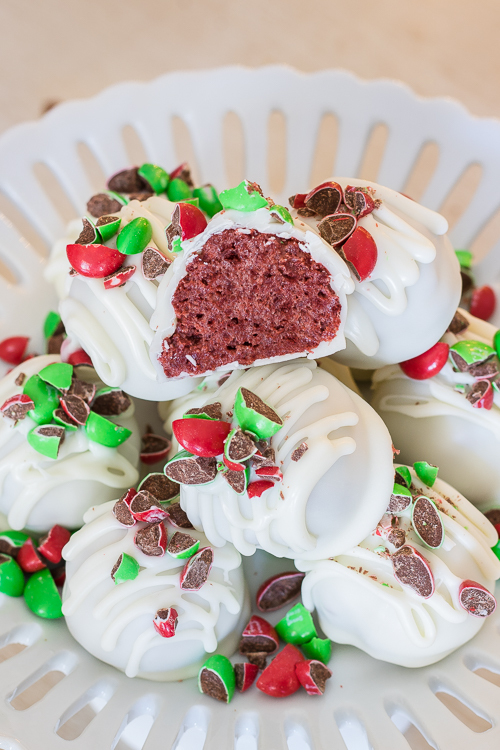 Red velvet oreo truffles, topped with holiday M&M’s can these get any more festive? I think not! If you have never made Oreo truffles before, just know that they are basically the easiest dessert to make. The hardest part would be the dipping, but I have a nice little trick to share that make these easily dippable too! In a food processor, add Oreos, pulse into crumbs and softened cream cheese. Mix until combined. Scoop out 1 tablespoon sized balls, roll them between your hands to make them round. Place on a sheet tray and place in the freezer. I like to let them sit overnight. Melt vanilla almond bark per the directions on the package. 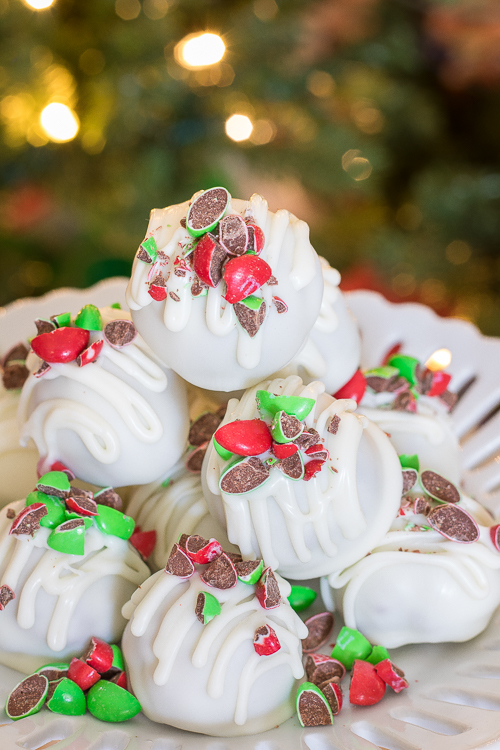 Dip truffles one at a time into the melted candy. Place them back on the try to harden. Drizzle with more melted candy and top with chopped M&Ms. The easiest way I have found is to dip the truffles in batches, leaving the others to sit in the freezer. As soon as the truffles start to thaw, I have noticed it is harder to dip them. I use a long skewer, I skewer the truffle just about 1/4 inch in the top, dip in the chocolate, in a small bowl to coat. Wipe off excess on the bottom of the truffle on the side of the bowl. Place on a try and if the truffle won’t release itself from the skewer, you can use a toothpick to help get it off. Now, you will have a little hole on top of each truffle, no biggie. This is where adding a drizzle of candy on top helps, place any leftover melted candy in a baggie, snip off a tiny part of a corner, now, fill the hole in the truffle and then drizzle a zig-zag on top. Immediately place the M&Ms on top, you have to do this one by one or else the melted candy will harden and the M&Ms won’t stick. 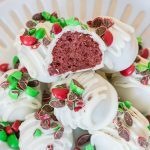 I hope you enjoyed this recipe, for even more yummies please visit my blog https://ThisSillyGirlsKitchen.com, see you there! In a food processor, add the Oreos and pulse into crumbs. Add the cream cheese and mix until combined. Using a cookie scoop or a spoon, scoop out tablespoon sized balls. Roll balls in your hands, place on a silicone mat or parchment paper lined sheet tray that will fit in your freezer. Let freeze overnight or at least 3 hours until frozen solid. Doing a few at a time, dip the truffles in the almond bark per instructions in the blog post. 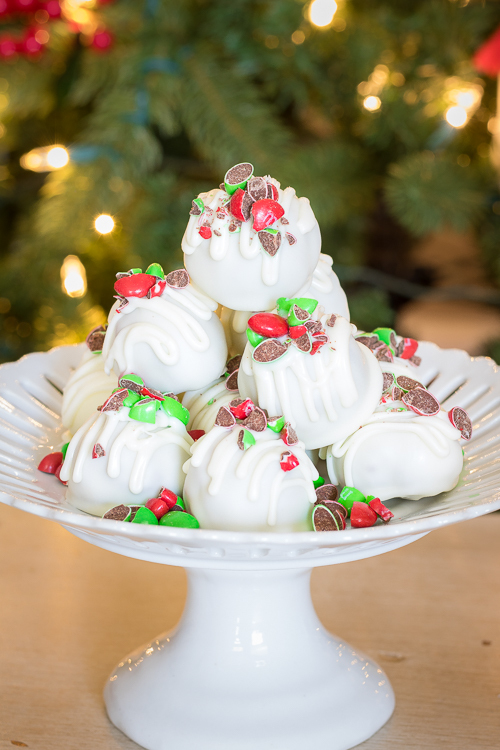 Add a drizzle of melted candy on top of each truffle, immediately add M&Ms for decoration, this is optional. You can also use more crushed up Oreos, sprinkles, or a drizzle of dark chocolate if you wish.